*If your Amazon store isn't showing it as free, let them know it's free on B&N and iTunes. Subscriptions are FREE for a limited time. Lady Katherine Henschel carried a stigma. As the daughter of an earl and the wife of a duke, she knew exactly where she stood in Society. She was anathema to them, evidence that one of their own was fallible. The carriage hit a rut, jostling her with enough force to start a violent drumming behind her eyes. As if that wasn't enough, a cramp started in her leg from her position in the mail-coach. It was the last time she'd ever travel with the mail just to get to London from Edinburgh in less than two days. And all for what? Further humiliation, no doubt. Katherine earned Society's censure when she was caught in the arms of her lover. Had she been more discreet, more aware of the possibility of discovery, she'd have been spared the loss of her friends, family, and acquaintances. She'd never have lost her vouchers to Almack's weekly assemblies and she never would have had to endure the whispers behind fans, the lowered eyes, or the snubs from those she'd once considered her closest friends. The other mail-coach passengers ignored her, but being ignored was something she'd long grown used to. When she stretched out her leg in an effort to relieve some of the pain, the woman beside her turned her head just a touch, shooting a glare from the corner of her washed-out blue eye. “Pardon me,” Katherine murmured, tucking her leg back under her and stifling the pinch of agony that shot up the abused limb. The sensation was nothing compared to what she'd endured at her husband's own hand. When she failed to produce the coveted male heir, he berated her, as if she alone were to blame. It took three failed pregnancies in five years to finally convince him she wouldn't breed. He bemoaned fate for saddling him with such a flawed wife, his diatribes becoming more violent and hurtful with each passing day. For five long years she'd watched her husband's love fade to resentment, bitterness, and abuse. Injured feelings, minor bruises on her otherwise flawless skin, and the sympathy of one she'd long considered her friend led to her downfall. It wasn't planned, far from it. Never had she considered playing her husband false. It was the trait she most abhorred in Society wives. But she faltered. 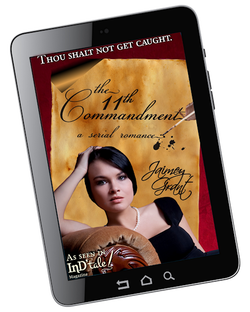 Anger, resentment, and Simon's sudden arrival just when Jarvis was out of Town left her vulnerable. Then Katherine broke the most important of all the commandments, the one Society held above all others. The unspoken one. The eleventh. ...Continued in InD'tale Magazine, July/August 2012 issue (must be a subscriber to see it; go to the home page to subscribe, www.indtale.com); Parts 2-10 are in subsequent issues. Subscribers can read the whole story for free. Simply visit the archive on InD'tale's site to get the past issues.